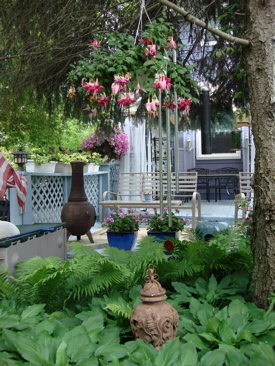 COLOUR in the garden should reflect how you want to feel there: relaxed, energetic, fun, calm or serene.... colour can do all of these, but of course, not all at the same time. 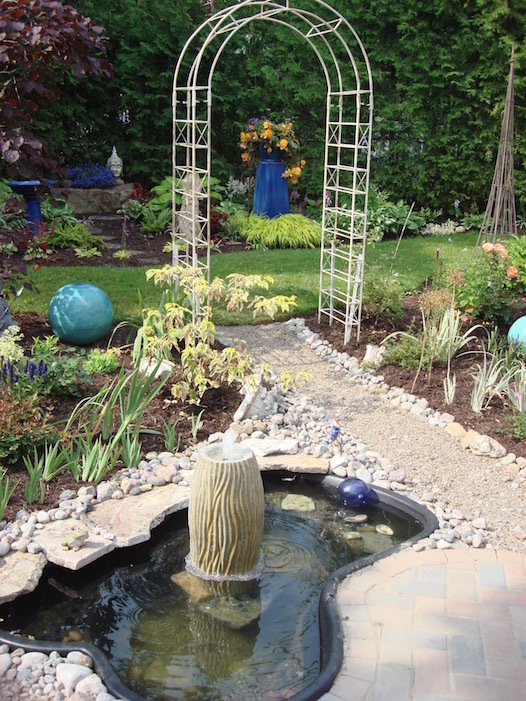 So think about how you will spend your time in your garden, and plan for the colours that will give that look and feel. YELLOW IN YOUR GARDEN? WHY?? WHY NOT?? 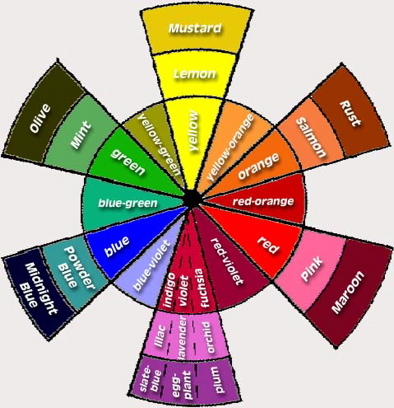 Speaking of colour, now is a good time to talk about how to choose colours. 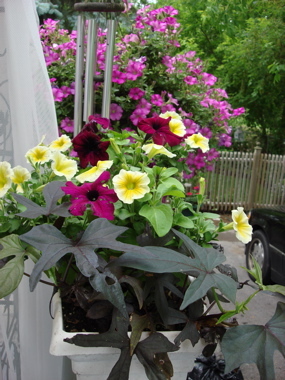 The fun part of container gardens is how flexible you can be… how you can add zip to your spaces… or a sense of calm. Decide what feeling you want and then choose the flowers and colours that fit that idea. …. Jot down your favourite colours…. 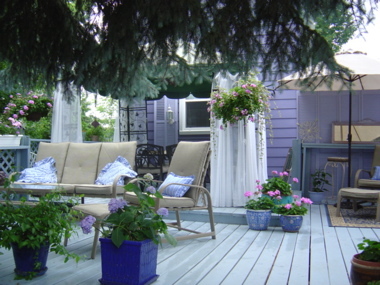 I like to use colours in my garden that I would not necessarily have in my home. Inside, I like calm and soothing colours and outside, I like to punch it up a few notches. Reds and yellows are warm colours. Even ‘hot’.They look festive and joyous… they're energetic and party-like…red and yellow are complimentary , or opposite colours on the colour wheel. 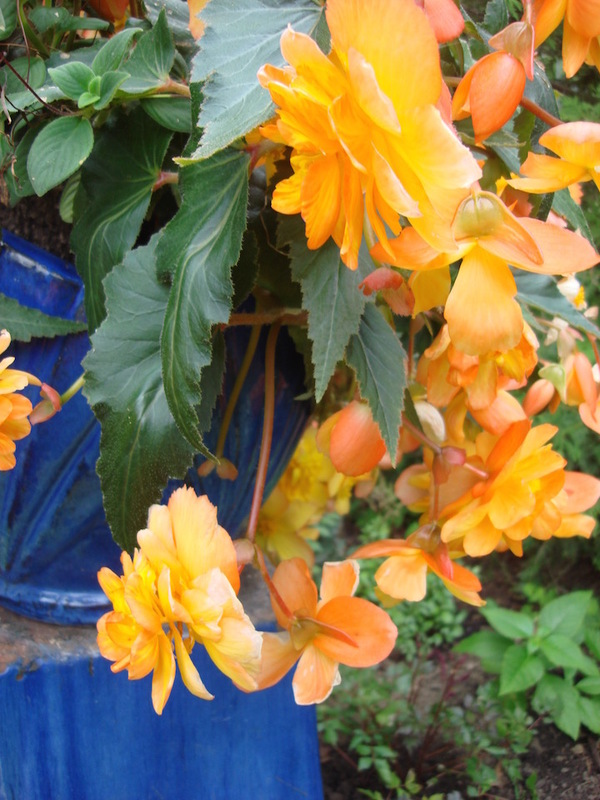 Look how this blue and orange pot, seen through the arbour below, pops and draws your eye right to the pillar even though it is in the back of the garden. Pinks, mauves and purples are calming and soothing as they are all shades of the same colour. Blues (violet, mauve, purple) and shades or fuchsia and pinks are called analogous colours (beside each other on the wheel). 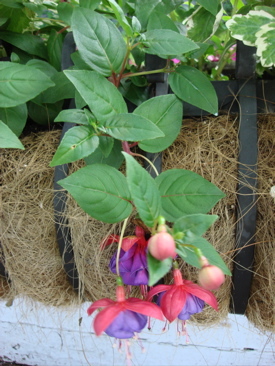 Of course, we could follow nature using a mixture of colours… reds, yellows, purples all together… you could call that a ‘riot of colour’ because it looks like an artist spilled her paint box in your container garden.